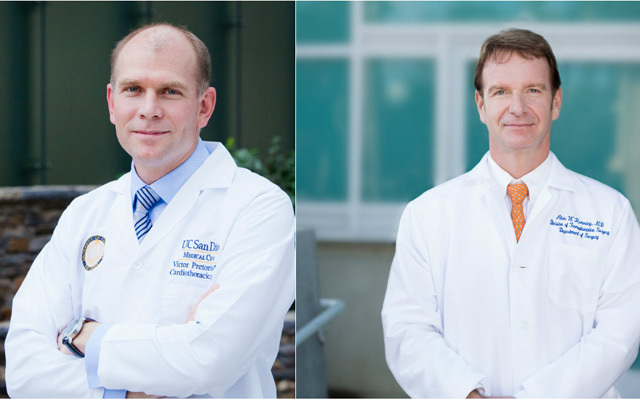 Surgeons Victor Pretorius, MBchB, (left) and Alan Hemming, MD, performed the first heart-liver transplant in San Diego. On November 4, 2016, surgeons at UC San Diego Health performed the region’s first combined heart-liver transplant (CHLT). 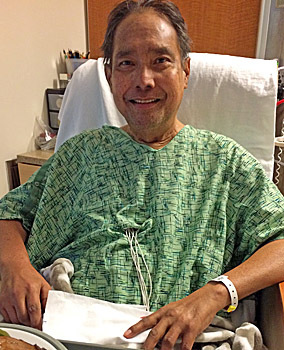 During the 10-hour surgery, 54-year old Frank “Sonny” Taitano received a healthy heart and liver. This is the first successful heart-liver transplant for San Diego; less than 10 of these surgeries are performed each year in the U.S.
During a 10-hour surgery, Frank “Sonny” Taitano received a new heart and liver at UC San Diego Health. 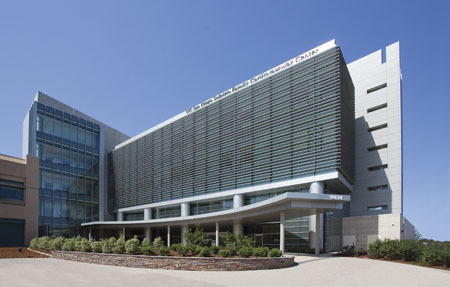 As the region’s only academic health system, UC San Diego Health has a comprehensive organ transplantation program and performs combinations of surgeries not performed in other hospitals, such as combined heart-lung, lung-liver-pancreas, liver-pancreas-kidney and heart-lung-liver transplantation. Graft survival after CHLT is similar to a heart or liver transplant — 80 percent at one year and 70 percent at 10 years. Hemming, who performed the liver transplant, noted that while few heart-liver transplants are performed, patient’s survival at experienced centers is similar to receiving a heart or liver alone. In uncommon instances where the recipient has a low level of antibody against the donor, the donor liver may offer some degree of immunologic protection by clearing those antibodies before they can damage the heart. Taitano was on a waiting list for more than 155 days. To extend his life while a suitable heart-liver match was found, he was placed for more than 50 days on a cardiac mechanical pump, called the Impella 5.0. Previously unreported in medical literature, this was the first time that this type of device has been used to sustain a patient for a CHLT. “By donating your organs, you give people like me a second chance at life. It’s happiness all around, for everyone,” said Taitano. UC San Diego Health is a leader in organ transplantation and performs combinations of surgeries not performed in other hospitals. UC San Diego Health is the only local hospital to perform heart-lung, living donor liver, and multi-organ chest-abdominal transplants. It has performed 28 heart transplants in the previous 12 months. For six consecutive years, U.S. News & World Report has ranked UC San Diego Health as the #1 adult hospital in the San Diego region.